Thirty years later some of the survivors from the Mighty 8th, including Colonel Budd Peaslee, S/Sgt. Phillip Taylor and 1st Lt. William Allen decided to form an organization to commemorate their fallen comrades-in-arms. They called it the Second Schweinfurt Memorial Association, Inc. (SSMA), giving it direct connection to the second air raid on Schweinfurt. Initially, the full members of this association were all veterans of the 8th Air Force who flew on Mission 115. Every year the members, and their families and friends, meet in a different city in the United States around the 14th of October to honor their dead fellow airmen. But there is more to this story: At the 50th Anniversary, two Germans, Dr. Helmut Katzenberger and Vomar Wilckens came to the reunion in New Orleans to present to the group information they had on that fateful day. Then in 1996, the SSMA members invited more of their former enemies, including Georg Schaefer, whose grandfather founded one of the "targeted" ball bearing factories, to attend their reunion in Las Vegas, Nevada. Mr. Schaefer, now retired from the Board of Directors of FAG Kugelfischer, had served, along with his classmates, in one of the 88mm Flakbatteries around Schweinfurt. He brought many artifacts from "Black Thursday". Many of these artifacts are permanently included in the Second Schweinfurt display at the Mighty 8th Air Force Museum in Savannah, Georgia. It was at this reunion that the Americans suggested erecting a joint memorial remembering this mission. Mr. Schaefer presented this idea to his fellow Luftwaffenhelfers, who embraced the idea and on June 16, 1998 a German American Memorial was dedicated on a site alongside the former “Spitalsee” air raid shelter in Schweinfurt. The memorial was created by G. Hubert Neidhard (3/3/28 - 5/14/99), who was an art teacher at Alexander von Humboldt High School in Schweinfurt and a flak-helper in his hometown during the war. This started the amicable meetings between members of the SSMA and the former flak helpers. In 1999, a group of former flak helpers, accompanied by Gudrun Grieser, Lord Mayor of the City of Schweinfurt, attended the reunion in Savannah, Georgia. Reno, Nevada was the site of the 2000 Reunion. 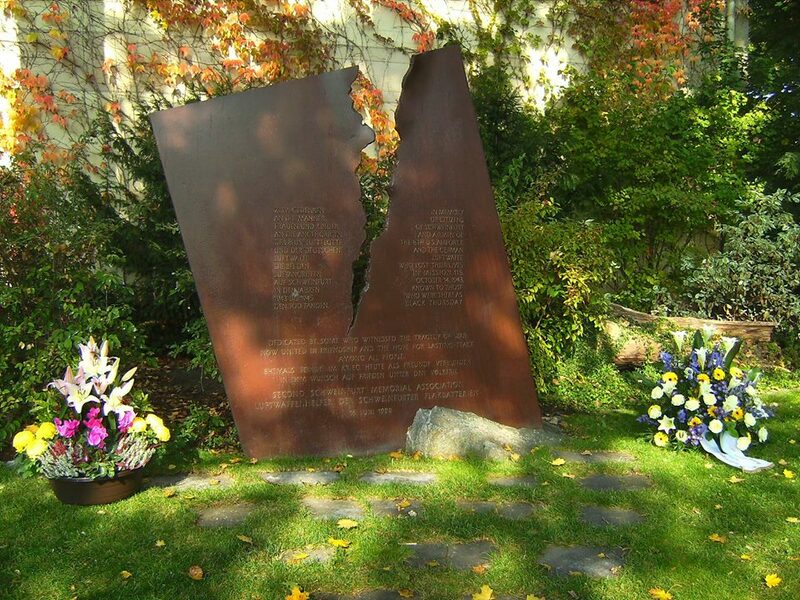 In 2001, SSMA decided to hold their reunion in Schweinfurt, the first time the organization had held their meeting outside of the U.S. Sixty two participants from the U.S. attended despite the disastrous events in New York and Washington on September 11. Fort Worth was the site of the 2002 Reunion. Seattle - 2003 and in 2004, the members will return to Schweinfurt. The bonding between former enemies is an impressive sign of active reconciliation, but also an admonition to future generations to do all they can so that horrors like those in the 20th century are never repeated. The inscription on the German American Memorial speaks to the bond between these two groups: "Dedicated by some who witnessed the tragedy of war, now united in friendship and the hope for lasting peace among all people".